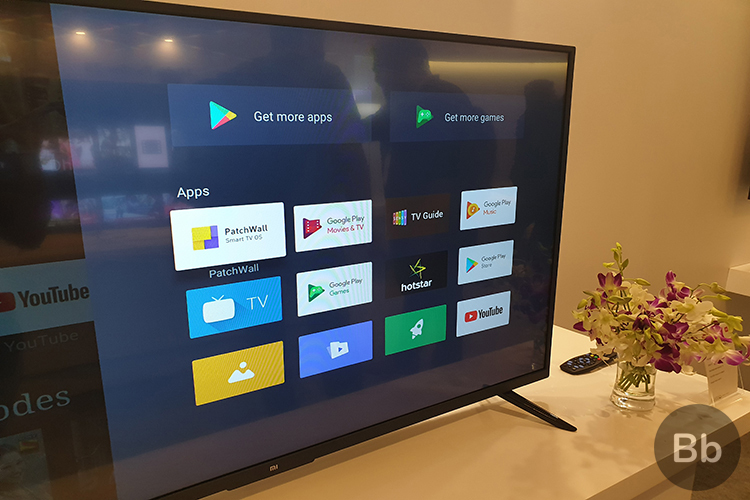 Xiaomi introduced its newest Mi TV 4 lineup, with an Android TV foundation, at its ‘Smarter Living’ launch event in Bengaluru yesterday. The new Mi TVs may not feature major hardware upgrades, but the software experience has received a massive facelift, thanks to the Android 8.1 Oreo-based Android TV under Xiaomi’s own PatchWall UI. As for PatchWall, it now comes integrated as the default launcher over the stock Android TV experience, which can be turned on with just one click on the bundled Mi Remote. The Mi TV Pro lineup being powered by Android TV means you get access to the Google Play Store, with over 3,600 compatible apps including Facebook Watch, YouTube, and more. But all that still doesn’t mean the new TVs support Netflix. Sadly, Xiaomi has not included native support for Netflix, even though the new TVs are more than capable of playing online content. You cannot find Netflix on the Play Store on Android TV, nor is it pre-installed, which is a big disappointment. But Xiaomi told us the company is in talks with Netflix, but some certification issues cropped up which meant the Mi TV Pro lineup was left bereft of Netflix. Xiaomi told us Netflix requires manufacturers to include a ‘Netflix’ button on the TV’s remote, which was not possible at this time. Netflix button lets you power up the TV and quickly jump to the streaming service without waiting for the rest of the smart TV UI to load. Such smart TVs are also recommended by the company on its own website as can be seen here. Xiaomi also informed us that it would need to integrate the Netflix catalog with the PatchWall UI, which is another complication holding up native support. The new Mi TVs have built-in Chromecast, so the Netflix app could work through your phone, but that’s not yet clear. As of now, the only clear way to watch Netflix on the TV is buying a separate Chromecast or Amazon Fire Stick and then casting through the Netflix app on your phone or PC. In older Mi TV models, you could sideload the Netflix app using some workarounds, but it remains to be seen whether they work on the new models announced yesterday. Well, we sure are disappointed about Netflix’s absence on the Mi TV Pro lineup, but do you think it’s a dealbreaker given that you can use it with a second streaming dongle? Let us know in the comments down below.